Is Your Diono Car Seat Recalled? Diono the car seat maker issues national recall for 500K car seats (convertible and booster seats)! In today’s hectic world, car safety is more important than ever, and even though most recalls are voluntary, companies are rarely inclined to shout their shortcomings from the mountaintop. 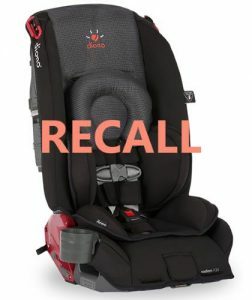 Diono recalled half a million child car seats, as they may not adequately protect children in event of a crash. On NHTSA Website, Parents can file a complaint about a car seat, register your car seat, and sign up for email notifications for car seat recalls. Documents posted by the U.S. National Highway Traffic Safety Administration states that when the seats are secured using a lap belt without the top tether, children over 65 pounds have an increased risk of chest injury in a crash. The company will send car seat owners a free kit with an energy absorbing pad and a new chest clip. The recall is expected to start on Nov. 22. Under federal regulations, once a manufacturer is aware of a safety problem it must – within five business days – inform N.H.T.S.A. of its plan for a recall or face a civil fine. Car seats and boosters provide protection for infants and children in a crash, yet car crashes are a leading cause of death for children ages 1 to 13. That’s why it’s so important to choose and use the right car seat correctly every time your child is in the car. Follow these important steps to choose the right seat, install it correctly, and keep your child safe. Every state in the United States requires that an infant or small child be restrained in a automobile for a reason, unintentional injury is the leading cause of death in children, and most such injuries are from car crashes. The best car seat r not always the most expensive one, it’s the one that best fits a child’s weight, size, and age, as well as your vehicle. Check out the correct usage at the car seat manufacturers website.